Coming off Damon Suede’s Lickety Split, I decided to take another cowboy diversion with The Real Thing by B.G. Thomas. 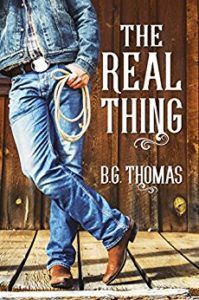 This quick read, Amazon has it slotted in the “under 90 minute” category, was a sweet and hot story of a man who loves real cowboys getting one of his own. Bryan has had a thing for cowboys his entire life. When he goes out, he dresses in what his roommate calls “cowboy drag.” The beginning of the story shows Bryan getting ready and I enjoyed reading just how much effort Bryan put into distressing his clothes so he’d look the “real” part. After years of trying, Bryan finally does find a real cowboy with Curtis. They click so well on their first meeting that Bryan is scared to reveal that he’s not real. I especially love Bryan has he has so much debate with himself about what he should do. They do move past the revelation and Curtis educating Bryan in cowboy was fun. These two are so good together that you can’t help but root for them from their first night together. The Real Thing is a very satisfying short read with a wonderful cute meet and perfect scenes that pull then men apart and put them back together again working towards just the right ending.